Serving the freshest ingredients, this lovely restaurant is worth a stop. It’s conveniently located in the center of the city, near the main Cathedral. It has a comfortable atmosphere, tasty Cremonese dishes at reasonable prices and a wonderful staff. Don’t miss it! This small trattoria is one-half block away from the lake on a quiet piazza. There’s both indoor and outdoor seating with decent views of the lake in the distance. This family run restaurant offers great food and friendly service. The fish is mostly local and very fresh. They also make their own fresh pastas served with seasonal vegetables or meats. 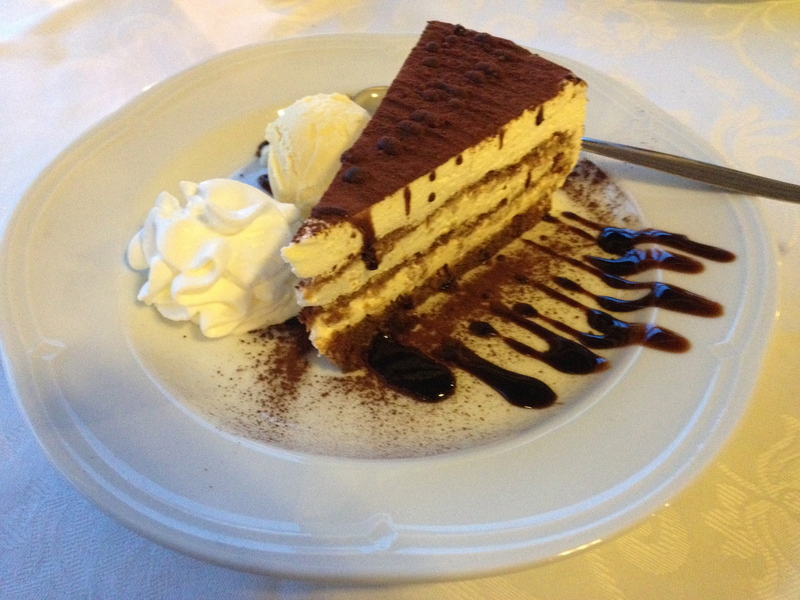 We saved room for dessert and shared a sumptuous cake with gelato. If you’re in the mood for Naples Style pizza, this fun restaurant won’t disappoint. There are two locations in Milan, but we ate at the one in the Brea neighborhood. This was some of the best pizza we tried outside of Naples. Besides their excellent pizza, they also serve specialize in seafood. You can also find a few more locations in Rome, Turin and Salerno. It seems like you can find almost any regional food in Milan. This modern trattoria will satisfy your hunger for typical Sicilian food. We had an excellent light lunch of arancini and salads. Then, we finished off with some fresh cannoli. This casual eatery was busy at lunchtime, but offered efficient and friendly service. You can also get take out for a fun picnic in the city. This small trattoria is an easy walk from the train station, yet it’s very quiet and cosy. We’ve eaten here several times and enjoy the traditional Milanese dishes and the warm and friendly atmosphere. The food is simple, always seasonal and good. Besides their interesting takes on pasta, they offer several varieties of risotto dishes—some with seafood and others with vegetables. They also offer a wide variety of fish depending on the season. There are several styles of pizza in Italy, and they all taste great to us. In Milan, the pizza that is called “Pizza Al Trancio” is cooked in a cast iron pan, much like Chicago Style pizza in the U.S. The crust is much thicker than the Naples style, but very good. The toppings will vary with each restaurant and region. This busy trattoria offers pizza, salads and an array of pasta dishes. It’s a busy spot, but they have more room than appears at first. The pizza is excellent and the fast and friendly service made us return several times. We stayed near the train station and this pizzeria is located nearby (Metro Lima).